Fireworks have a rich history, and many summertime events would not be the same without them. Nowadays, bottle rockets and Roman candles are common fare, but there was a time that few firecrackers existed. In fact, it was by accident that the first “natural” firecrackers were discovered. History.com reports that sometime around 200 B.C, the Chinese accidently discovered bamboo created a loud pop when heated in fire. These “proto-firecrackers” were used to keep animals away. Centuries later, alchemists would invent an early form of gunpowder that would increase the sound of the bamboo tubes, now capable of loud blasts. These early firecrackers would mostly be used in religious and folk traditions, such as the warding off evil spirits. Firecrackers were very popular in China and were often used in festivals. Firework displays would become very important in Chinese traditions as the technology developed. Over time, the Chinese would replace the bamboo rods with paper tubes, allowing the invention of crude explosive arrows. Over time, this technology would be further developed to create the first rockets. These simple rockets were not very accurate, but served to strike fear in the hearts of enemy combatants. Over time, rocket technology was further developed and rockets became more accurate and deadly. During this period of development, the science of rockets and bombs moved to Arab countries, according to Wikipedia. Thanks to this migration, European knights were exposed to gunpowder and firecrackers for the first time during the Crusades. Crusaders brought these “marvels” home, sparking interest across Europe. Around 1292, Marco Polo brought firecrackers back to Italy, sparking a huge interest with the Italians. During the Renaissance, military rockets would be modified with different compounds to create new colors and types of fireworks. Now it was possible for the first time to create the colorful displays that are so common today. Not only did the Italians create new colors and the first true airborne fireworks, but they were instrumental in the development of other types of fireworks like the Roman candle and brilliant aerial displays. At first, only nobles and royalty used fireworks as a show of wealth and power, but that would change. 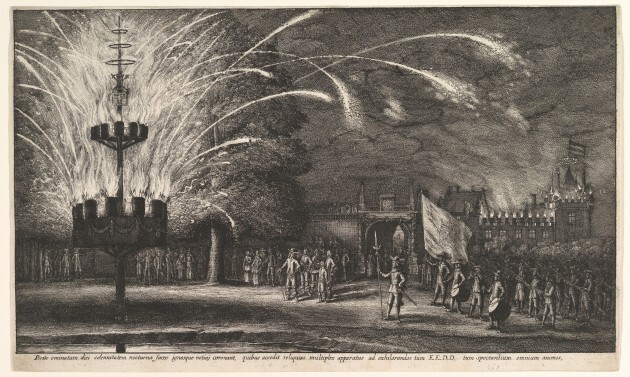 Sometime during the 1730s, firework displays were made public in England. What used to be a privilege only for the wealthy started to be a part of life for the common folk. These displays were extremely popular and even helped bring fireworks to the Americas. Fireworks were used to celebrate special occasions and holidays. It should come as no surprise that many think of fireworks and the Fourth of July at the same time. Since the year after the signing of the Declaration of Independence, firework and firecrackers have been used in celebration of the birth of a nation. John Adams predicted in a letter to his wife that the Fourth would remain a celebration which people marked with fireworks, a prediction that holds true to this day. Cohen, Jennie. "Fireworks’ Vibrant History." History.com. The History Channel, 1 July 2011. Web. 5 June 2014. "Fireworks." Wikipedia. N.p., n.d. Web. 5 June 2014.